Since we launched FlightBox last January, the most frequent request – by far – has been to add AHRS capabilities. We started working on a design as soon as we dug out from under the avalanche of Kickstarter orders in March. After nine months of designing, r e-designing, refactoring and prototyping I am happy to announce that now have a final design. We will begin taking pre-orders on Monday, November 28 (“Cyber Monday”) and expect to deliver in January. InvenSense MPU-9250 IMU – a multifunction sensor that includes a 3-axis accelerometer, 3-axis gyroscope, and 3-axis magnetometer. The MPU-9250 provides inertial and magnetic data to the AHRS algorithm. Bosh BMP-280 Barometric Pressure Sensor – a high-precision digital altimeter. u-Blox MAX-M8 GNSS Receiver – a WAAS GPS receiver with a 10 Hz update rate, an onboard high-gain antenna, and support for remote powered antennas. The data provided by these sensors will allow FlightBox to create an accurate estimate of your aircraft’s attitude, position, and cabin altitude. The attitude data can be used to drive attitude and synthetic vision displays on compatible1 EFB applications. The barometric sensor provides accurate cabin altitude – typically within 25′ of barometric altitude in unpressurized aircraft. The GPS – our first internal GPS since we dropped the VK-172 in May – assists in the attitude solution and provides highly accurate position information. The board also includes a set of status LEDs and a fan speed controller. 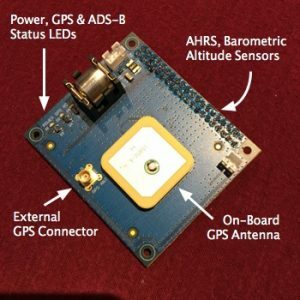 The LEDs show power status, GPS lock status, and ADS-B reception status. The fan controller adjusts fan speed based on system temperature, saving battery power. The new board is built as a “shield” for the Raspberry Pi computer. It attaches directly to the 40-pin option header on the Pi, making installation very easy. As we’ve done for our other accessories, we will publish a video that takes you through the installation process step-by-step. We will be offering the new board in two configurations. For FlightBox owners we will have a complete upgrade kit that includes the board, a new top, and an new fan. Stratux DIY users (who are not using a FlightBox case) will be able to order just the board. 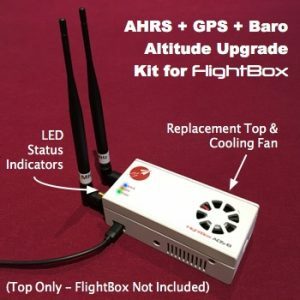 The complete FlightBox upgrade kit will sell for $160. The board-only kit will sell for $140. AHRS requires a combination of hardware and software. The hardware on the new board will require a FlightBox update which we will release when the boards start shipping in January. The update will also include the serial output feature and an automatic flight logging feature. For those who would prefer to leave the installation and the update to the professionals, we will be offering an update / upgrade service for an additional $25. Send in your existing FlightBox and we will send it back with the AHRS board, new top and updated firmware. 1. The FlightBox attitude feature is not currently compatible with ForeFlight.